A retention or holding tank is required where no discharge of treated or untreated sewage is allowed in a port area. The sewage is pumped out to shore reception facilities or overboard when the vessel is proceeding on passage at sea, usually beyond the 12 nautical mile limit. Straight holding tanks for retention of sewage during the period of a ship's stay in port were of a size large enough to contain not only the actual sewage but also the flushing water. Each flush delivered perhaps 5 litres of sea water. Passenger vessels or ferries with automatic flushing for urinals required very large holding tanks. Problems resulting from the retention of untreated wastes relate to its breakdown by anaerobic bacteria. Clean breakdown by aerobic organisms occurs where there is ample oxygen. In the conditions of a plain retention tank where there is no oxygen, anaerobic bacteria and other organisms thrive. These cause putrefaction, probably with corrosion in the tank and production of toxic and flammable gases. 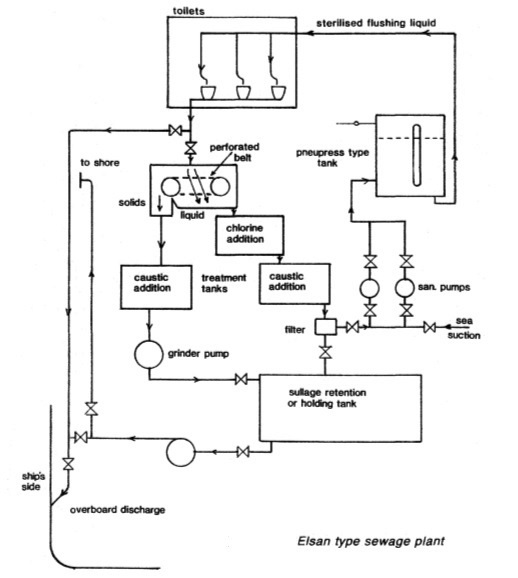 The Elsan type plant (Figure below) has an initial reception chamber in which separation of liquid and solid sewage takes place. Wastes drop on to a moving perforated rubber belt (driven by an electric motor) which the liquid passes through but solids travel with the belt to fall into a caustic treatment tank. Solids are then transferred by a grinder pump to the sullage or holding tank.